Donald Trump’s firing of a second department secretary in less than a month continues his building of an administrative record that stands in stark contrast with that of his predecessor. Veterans Affairs Secretary David Shulkin was terminated by Trump last Wednesday and lasted just 1 year, 1 month, 15 days on the job after entering into service in mid-February 2017. The average length of time these four presidents served alongside their first VA secretary was 3.9 times longer (1,583 days) than Trump and Shulkin (408 days). Shulkin’s firing comes on the heels of several historically quick exits of several department heads during Trump’s first 14 months in office. Health and Human Services Secretary Tom Price lasted only 232 days on the job upon his resignation last September to mark the shortest tenure ever recorded among the 23 men and women who served as secretary of that department and its predecessor (Health, Education, and Welfare). Price lasted less than a quarter of the time on the job than the average HHS secretary. Secretary of State Rex Tillerson recorded the third shortest tenure of a president’s first pick for the nation’s top diplomat at 1 year, 2 months (Tillerson’s last official day was Friday). The average tenure of a president serving alongside his first secretary of state is 3 years, 4 months, 8 days – or 2.9 times longer than Trump and Tillerson. Finally, Homeland Security Secretary John Kelly was plucked from his position last summer to become Trump’s chief of staff after the shortest time in office heading that department at just 6 months, 12 days. These early departures are a marked change from the stability found during Barack Obama’s administration, particularly during his first term. Just missing the cut is Tom Vilsack of Agriculture whose tenure of 7 years, 11 months, 25 days was the fourth longest of the 31 men and women to head that department since its formation in 1889. 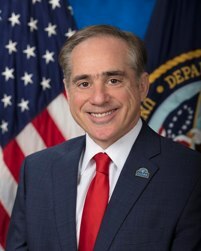 Overall, Shulkin exited with the second-shortest stint as VA secretary, just outlasting James Peake (1 year, 1 month, 1 day) who took office 13 months before the end of George W. Bush’s final term in office. Next: Can Republicans Pick Up Elizabeth Esty’s US House Seat? 1 Comment on "David Shulkin and Trump’s Vanishing Cabinet"
2. For part 4 of the TURNSTILE cabinet series, Pruitt at EPA? Carson at HUD? DeVos at Education?